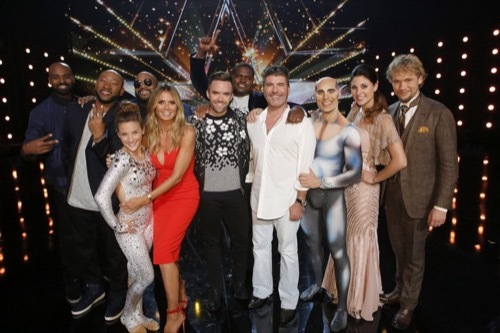 Tonight on NBC America’s Got Talent returns with an all-new Wednesday, September 7 episode and we have your America’s Got Talent recap below! On tonight’s AGT Episode the finalists perform one last time for America’s vote and the $1 million prize. Did you watch last night’s episode where The Clairvoyants, Brian Justin Crum, Linkin’ Bridge, Sofie Dossi and Viktor Kee moved on to the finale? If you missed it don’t worry we have you covered with a full & detailed America’s Got Talent recap of last night’s episode, right here! The top 10 will compete live with one last performance to win $10 million. The winner will be revealed tomorrow. Musical guest star Pitbull enters from the back of the theater to kick off the night, singing with Lunch Money Lewis. The hosts come out on the stage, dancing with the exception of a stiff looking Simon. Nick Cannon makes an entrance, dancing around. The judges are ready. The pizza delivery guy, Sal Valentinetti, from Long Island, NY is the first scheduled to perform. Before he performs we see him share a moment with his family, who are emotional over the 10th anniversary of his grandmother’s death. Sal hits the stage with his incredible voice, performing with musicians in white while he dons a black tux to complete his old school performance. He calls out all of the judges in his performance, singing Back in Town from Frank Sinatra. The judges look impressed, standing after his performance. Heidi feels blown away. Mel thinks he smashed it with his confidence and personality. Howie is happy about it while Simon hated to see his performance end. Simon thinks he is a great guy who has set the bar high for his competition. Sofie Dossi is up next. We see her past performances play out before her live performance. She reads from her diary about her time on AGT. Wearing a beautiful purple sparkly bodysuit, Sofie twists and curves her body on a tiny bar. She breaks into a whirlwind of back flips before grabbing onto her hoop and dancing in the air. Her performance has the crowd going wild. Nick calls her incredible with all the judges standing. Mel is impressed that she added the element of danger. Heidi loved her spinning, calling her mesmerizing to watch. Simon is astonished by her, calling this her best performance. He would give her a 10. Howie can’t find words to describe what she does. Linkin’ Bridge is third to perform. The foursome sing a slow, moody ballad against a dark backdrop. Hitting all the notes, each member takes a turn singing while the other three supply the chorus to When I See You Again. They also get a standing ovation. Heidi thinks they chose a great song. Simon loved the entire performance. Howie loves the songs they choose and how they perform. Mel B. thinks they all look dapper and they get better and better when it comes to their harmony as a group. Opera singer Laura Breton cannot believe she is in the finals of AGT. It’s a dream she isn’t ready to wake up from yet. Wearing a beautiful white gown, Breton begins her performance. Listening to her mature opera voice is incredible, coming from such a young girl. The crowd seems quiet and in awe of her. Violins play out in the background as she sings an incredibly emotional song, leveraging her voice to hit the highest note as she finishes with a bang. Nick calls her performance beautifully done. Simon doesn’t know a lot about classical music, and cannot believe she is 14 years old. She sings with passion and keeps the perfect pace. Howie thinks she is a million dollar performance. Mel felt her nerves a bit but feels she hit every note with accuracy. Heidi calls her performance one of a princess who rules the stage like a queen. The Clairvoyants are the fifth performance to hit the stage. We hear their story of how they first met and their powerful connection. The two play with the audience, guessing what is in their wallet and one member of the crowd’s birthday. Simon takes out his wallet and passes it to Howie. A tank filled with water on the stage is checked before Emily plunges into it. Howie must check the expiration date of one of Simon’s cards and read it out loud. In the tank, Emily writes the correct numbers on the side of the tank while she is completely submerged. Mel has no words for their performance and cannot figure out how they did it. Brian Justin Crum is up next. Prior to his performance, he watches a video packed with all of his fans across the globe who have been inspired by his story. He chooses to sing Michael Jackson’s Man in the Mirror. It’s a slow and emotional rendition that has fans going crazy. His voice is incredible. Brian also grabs a standing o. Mel thinks he took a risk for his song choice, but she thinks it will pay off. Heidi loved the intensity. Simon loved what he has done in the last couple of weeks, calling him a naturally brilliant performer. Howie calls his performance epic. Tape face hits the stage. He plays with horses before making music with his hands. He calls on Mel B to come up on stage and gives her pom poms to shake. She doesn’t look thrilled. He then puts a toilet seat around her head. She is silently disgusted. He throws a plunger at her, aiming for the toilet seat and hits it. He finishes off his performance with his hand horses. Heidi calls him a true original. Simon wants to know what the bloody hell that was. He thinks it was weird and fantastic. Howie, I loved it. It’s so stupid, it’s wonderful. Mel B called it a laugh out loud performance. Viktor Kee makes his entrance on and incredible set of mountains, thunder, lightning, and smoke. He juggles blindfolded with 3 balls. He incorporates dance and balance, shooting the balls high up in the sky, jiggling them around his mid-section. Fire suddenly surrounds him. He picks up a ball that is on fire and juggles with it. Simon loved the graphics, the sounds, the lightening. It was stunning performance. Howie calls it an eruption of talent. Mel picks up on the fact that he dropped one ball. Simon is annoyed by her comment. Heidi calls him a true artist, she can feel his passion. John Dorenbos talks about the game of football. The AGT finals are equivalent to the super bowl for him. He gives all of the judges a card to write their name and for Simon to write the name of someone who is important to him. John talks through his act while discussing how magic saved his life. As he works through the deck of cards he pulls out all of their names. His tricks has Simon smiling. He gets a standing O. Howie calls it inspirational. He calls John a star. Mel was impressed that he made things appear. Heidi loved his positivity. She thinks he is a class act. Simon would love to see John become the winner of this show. Grace Vanderwaal is the last of the Top 10 to perform. She plays her ukulele on a platform surrounded by archways of flowers. Her voice has the crowd going crazy, holding up lighters. Howie calls her amazing grace. This is his favorite moment of the night. Mel tells her well done. Heidi calls her a rare diamond who shines brighter than everyone else. Simon thinks she did it all in a real way. She is amazing.